Our primary care providers and team of health care professionals will treat you with a personal touch at our clinics in Corvallis, Monroe, Alsea, Lebanon, and Sweet Home. As our patient, your complete health is our goal. Our patient-centered teams are dedicated to providing you with excellent, affordable care. Four of our clinics: Benton, Lincoln, Monroe, and East Linn are recognized by the Oregon Health Authority (OHA) as Five Star Status clinics. This is the highest recognition a clinic can obtain. Our newest clinics in Sweet Home and Alsea continue to be ranked as Tier 3 clinics. 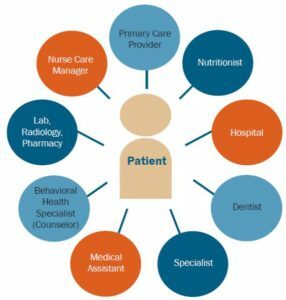 Patient-Centered Care is tailored to each patient’s unique needs and preferences. It is a goal for high-quality health care because it increases quality, improves health outcomes, and reduces costs. We recognize that all patients have unique needs. When we tailor services for you, we consider your primary language, generational issues or attitudes, and other preferences, to create a plan that meets your individual needs. Our health care professionals take a personal interest in helping you achieve a healthy life in an encouraging and nurturing environment. The term ‘primary care home’ describes the feeling of knowing who to ask when you have questions about your health, and where to go when you have health needs. When you join our Health Center family, you have a team of professionals who care. Accessible: Care is available when patients need it. Accountable: Clinics take responsibility for their community and provide quality care. Comprehensive: Patients get the care, information and services they need to stay healthy. Patient & Family Centered: Patients and families are the most important part of health care. Care draws on a patient’s strengths to set goals, and communication is culturally competent and understandable for all. To learn more about Patient-Centered Primary Care Homes (PCPCH) visit the Oregon Health Authority webpage.